Controversy over the links between supplementation, genomics, and treatment response may have been due to researchers asking the wrong question. Pharmacogenomics is the study of the interaction between drugs and the human genome, in an effort to use a rational approach to maximize individual patient benefits and minimize adverse events. This potential was recognized as early as 510 BC by Pythagoras of Samos, when he noticed a connection between fava bean ingestion and hemolytic anemia in certain people.1,2 It was not until 1961 that a deficiency in G6PD was found to be responsible for favism. Around the same time, it was recognized that abnormalities in butyrylcholinesterase can result in serious adverse reactions after succinylcholine-aided anesthesia. It took another half century before we had the first FDA-approved pharmacogenetic test for cytochrome CYP2D6 and CYP2C19 alleles. The FDA requires many drugs to carry labels warning of specific gene interactions (www.fda.gov/Drugs/ScienceResearch/ucm572698.htm). • Pharmacogenomics is the study of the interaction between drugs and the genome. • More than 30 genes affect the risk for and progression of AMD. • Used in clinical practice and in the management of patients with wet AMD, genetic information can help us better understand and treat the disease. Age-related macular degeneration (AMD) is one of the most genetically influenced multigenic diseases found in humans, with more than 30 genes known to affect its risk and progression.3,4 Variants of two particular genes, complement factor H (CFH) and age-related maculopathy susceptibility 2 (ARMS2), have the strongest influence on AMD development and progression. These genes have been shown not only to affect progression to the diseased state but also to affect patients’ responses to therapy. Given the heterogeneity in study designs and resulting heterogeneous findings, it is no surprise that genetic information continues to be underused in clinical practice and overlooked in the management of patients with wet AMD. Unlike wet AMD, for which there are efficacious treatments,11-13 there is no therapy shown to be effective for nonneovascular, or dry, AMD. Only one study, the Age-Related Eye Disease Study (AREDS) Report No. 8, has shown that supplementation with high-dose vitamins and zinc in patients with advanced AMD (categories 3 and 4) can reduce progression to advanced AMD by about 25%.14 Detailed analysis reported in this study revealed that only progression to the wet form of the disease was statistically significantly affected (0.62, 95% CI = 0.43–0.90, P = .001), whereas atrophic changes showed opposing, non–statistically significant trends, for central (decreasing trend, P = .13) or noncentral (increasing trend, P not provided) geographic atrophy (GA). Several years after AREDS Report No. 8 was published, several authors attempted to investigate the pharmacogenomics of this supplementation, leading to controversy in the literature. Investigating a combined endpoint of progression to both neovascular and central GA stage in a post hoc fashion, Klein et al suggested that the benefit of the AREDS formulation (PreserVision; Bausch + Lomb) may be reduced in patients with high CFH risk allele.15 A subsequent post hoc study by Awh et al, considering a partial cohort of the AREDS study population, suggested that high CFH risk may actually be harmful, and that patients with the ARMS risk allele may benefit even more from use of the formulation than the average patient.16 However, as noted, that study did not include the full AREDS dataset and lacked a validation group, which is important in any retrospective analysis. Subsequently, investigators for AREDS Report No. 38 could not replicate the interactions between genetics and response to supplementation reported by Awh et al.17 It is interesting to note, however, that AREDS Report No. 38 analyzed so many genetic subgroups and treatment variations that it resulted in small sample sizes for each subgroup and diminished overall statistical power. Thus, for each individual subgroup, the study could not identify any group with statistically significant benefit. To increase statistical power, Awh et al subsequently analyzed only four subgroups based on CFH/ARMS2 risk alleles and replicated their original conclusions,18 still without including a validation cohort. Assel et al then further examined this controversy and could not find an interaction between supplements and genetics and progression to advanced AMD.19 It should be noted, however, that none of these studies evaluated progression only to wet AMD. These data provide further support that response to the AREDS formulation treatment differs substantially among individuals, based on genetic risk. Unlike FDA-approved drugs that must have two phase 3 randomized trials to demonstrate efficacy and safety before being allowed to go to market, there has been no placebo-controlled replication study of the efficacy of the AREDS supplements. This is because the manufacturer markets the formulation as a supplement with the disclaimer that it is not intended to treat or prevent any disease, rather than as a drug with therapeutic impact; thus, it bypasses FDA jurisdiction. Furthermore, the lack of a controlled replication-validation trial has not prevented the widespread acceptance and recommendation of the AREDS formulation treatment for patients with intermediate AMD. 1. Lioia N. Il favismo nella sua sintomatologia, anatomia patologica e patogenesi con contributo personale anatomoclinico [article in Italian]. Policlinico Prat. 1947;54(23):617-625. 2. Wharton HJ, Duesselmann W. Favism; a short review and report of a case. N Engl J Med. 1947;236(26):974-977. 3. Miller JW. Age-related macular degeneration revisited—piecing the puzzle: the LXIX Edward Jackson memorial lecture. Am J Ophthalmol. 2013;155(1):1-35.e13. 4. Fritsche LG, Igl W, Bailey JN, et al. A large genome-wide association study of age-related macular degeneration highlights contributions of rare and common variants. Nat Genet. 2016;48(2):134-143. 5. Chen G, Tzekov R, Li W, Jiang F, Mao S, Tong Y. Pharmacogenetics of complement factor H Y402H polymorphism and treatment of neovascular AMD with anti-VEGF agents: a meta-analysis. Sci Rep. 2015;5:14517. 6. Hong N, Shen Y, Yu CY, et al. Association of the polymorphism Y402H in the CFH gene with response to anti-VEGF treatment in age-related macular degeneration: a systematic review and meta-analysis. Acta Ophthalmol. 2016;94(4):334-345. 7. Hu Z, Xie P, Ding Y, Yuan D, Liu Q. Association between variants A69S in ARMS2 gene and response to treatment of exudative AMD: a meta-analysis. Br J Ophthalmol. 2015;99(5):593-598. 8. Valverde-Megías A, Veganzones-de-Castro S, Donate-López J, Maestro-de-Las-Casas ML, Megías-Fresno A, García-Feijoo J. Graefes Arch Clin Exp Ophthalmol. 2017;255(11): 2091-2098. 9. Wu M, Xiong H, Xu Y, et al. Association between VEGF-A and VEGFR-2 polymorphisms and response to treatment of neovascular AMD with anti-VEGF agents: a meta-analysis. Br J Ophthalmol. 2017;101(7):976-984. 10. Lorés-Motta L1, van Asten F, Muether PS, et al. A genetic variant in NRP1 is associated with worse response to ranibizumab treatment in neovascular age-related macular degeneration. Pharmacogenet Genomics. 2016;26(1):20-27. 11. Miller JW. VEGF: From discovery to therapy: the Champalimaud Award Lecture. Transl Vis Sci Technol. 2016;5(2):9. 12. Miller JW. Beyond VEGF-The Weisenfeld Lecture. Invest Ophthalmol Vis Sci. 2016;57(15):6911-6918. 13. Miller JW, Bagheri S, Vavvas DG. Advances in age-related macular degeneration understanding and therapy. US Ophthalmic Rev. 2017;10(2):119-130. 14. [no authors listed.] Age-Related Eye Disease Study Research Group. A randomized, placebo-controlled, clinical trial of high-dose supplementation with vitamins C and E, beta carotene, and zinc for age-related macular degeneration and vision loss: AREDS report no. 8. Arch Ophthalmol. 2001;119(10):1417-1436. 15. Klein ML, Francis PJ, Rosner B, et al. CFH and LOC387715/ARMS2 genotypes and treatment with antioxidants and zinc for age-related macular degeneration. Ophthalmology. 2008;115(6):1019-1025. 16. Awh CC, Lane AM, Hawken S, et al. CFH and ARMS2 genetic polymorphisms predict response to antioxidants and zinc in patients with age-related macular degeneration. Ophthalmology. 2013;120(11):2317-2323. 17. Chew EY, Klein ML, Clemons TE, et al; for the Age-Related Eye Disease Study Research Group. No clinically significant association between CFH and ARMS2 genotypes and response to nutritional supplements: AREDS report number 38. Ophthalmology. 2014;121(11):2170-2180. 18. Awh CC, Hawken S, Zanke BW. Treatment response to antioxidants and zinc based on CFH and ARMS2 genetic risk allele number in the Age-Related Eye Disease Study. Ophthalmology. 2015;122(1):162-169. 19. Assel MJ, Li F, Wang Y, Allen AS, Baggerly KA, Vickers AJ. Genetic polymorphisms of CFH and ARMS2 do not predict response to antioxidants and zinc in patients with age-related macular degeneration: independent statistical evaluations of data from the Age-Related Eye Disease Study. Ophthalmology. 2018;125(3):391-397. 20. Seddon JM, Silver RE, Rosner B. Response to AREDS supplements according to genetic factors: survival analysis approach using the eye as the unit of analysis. Br J Ophthalmol. 2016;100(12):1731-1737. 21. Vavvas DG, Small KW, Awh CC, Zanke BW, Tibshirani RJ, Kustra R. CFH and ARMS2 genetic risk determines progression to neovascular age-related macular degeneration after antioxidant and zinc supplementation. Proc Natl Acad Sci U S A. 2018;115(4):E696-E704. 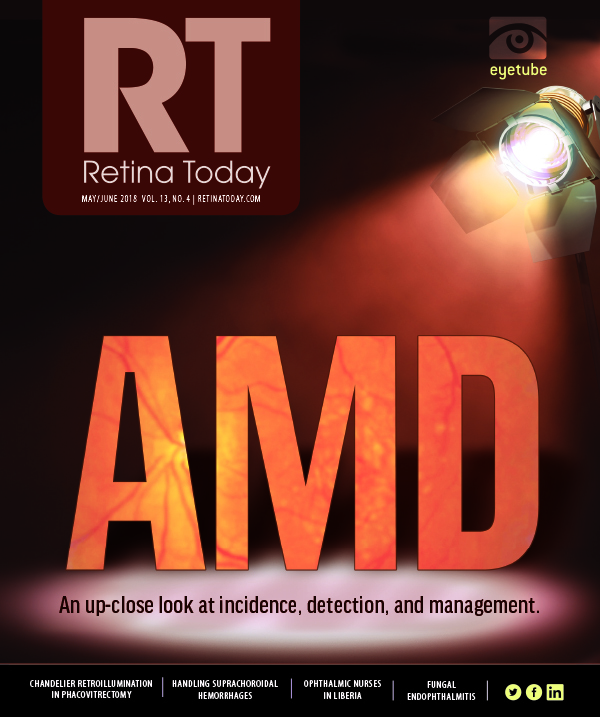 A Long-Term Treatment Option for AMD?